Unlike many chiropractors, Dr. Whitted didn’t grow up around chiropractic and even believed it could be harmful or dangerous before he found out more about the profession. He first went into athletic training during his undergraduate years at Gardner-Webb University, wanting to help athletes return to their sport and enjoying their life. As a way to learn more about how the human body works, and its potential, he completed a Masters in Exercise Physiology at East Tennessee State University. During his time in graduate school he considered physical therapy, but things would just not align to allow that to happen. “I realized that maybe physical therapy wasn’t the path God had planned for me.” He took stock of his life when, out of nowhere, the idea of becoming a chiropractor dawned on him. Despite his upbringing in the medical model, Dr. Whitted was certain that God was directing him to the chiropractic profession. He spoke with a chiropractor who was a friend of his late father that had been in practice for decades. 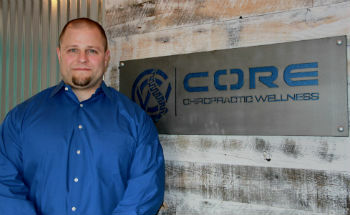 “The chiropractor showed me around his office, explained chiropractic to me and started me as a patient so that I could understand what we were doing.” After this experience, Dr. Whitted knew without a doubt that he wanted to become a chiropractor. Dr. Whitted was able to remain close to home to complete his chiropractic education, enrolling just up the road at Sherman College of Chiropractic in Spartanburg. “I learned how the body could truly be healed, and it definitely fit with my belief system.” Now, Dr. Whitted cannot imagine any other career and is passionate about helping those in need of care. He relates well to those who aren’t familiar with chiropractic or are unsure of where to turn. When he isn’t busy at the office, Dr. Whitted stays active in the gym, particularly with powerlifting. As a former drag racer, he likes cars (the louder, the better) and hopes to have more time to spend on the track racing one day. He’s also a photography buff and enjoys being in nature. If you’d like to find out more about what Dr. Whitted may be able to do for you, contact us today! Same-day appointments are available.